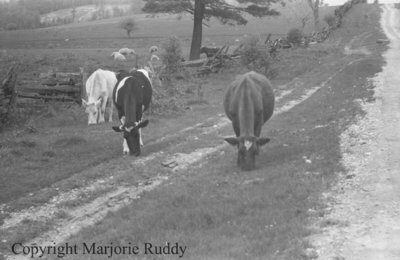 A black and white negative of cattle grazing along a country road. Wooden rail fences line the fields along the road. Sheep are visible in the distance. The negative envelope states that the unidentified road is in "Durham County". Cattle on a Country Road, May 23, 1938, Marjorie Ruddy. Whitby Archives A2013_040_984B.